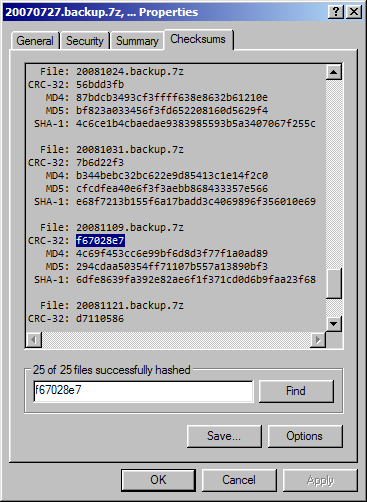 HashCheck can process and verify the checksums/hashes stored in checksum files—these are files with a .sfv, .md4, .md5, or .sha1 file extension. Just double-click on the checksum file, and HashCheck will check the actual checksums of the listed files against those specified in the checksum file. HashCheck will add a "Checksums" tab to the shell's file properties dialog so that you could easily check the hash of a file (or even multiple files and directories) from Windows Explorer. You can also save the results to a checksum file. If you want to create a checksum file but think that opening the file properties dialog, navigating to the "Checksums" tab and then clicking "Save" is too much trouble, HashCheck simplifies the task by adding an optional "Create Checksum File" command to the shell's context menu. Simply select the files and directories that you want to hash and create a checksum file for, right-click on them, and select "Create Checksum File". The HashCheck Shell Extension has a very small memory and disk footprint (the 32-bit version consumes less than 100 KiB of disk space). It is also very fast and responsive; it can, for example, load and parse a SFV file with a million entries in just a fraction of a second. The HashCheck Shell Extension is open-source, licensed under a BSD-style license, so that anyone with some knowledge of C can easily build their own customized version of this shell extension. The user interface text has been translated into many languages, so that it will blend in seamlessly with most systems. Additionally, this shell extension is natively Unicode and can thus support a wide range of file and directory names. Page last modified on 2009/07/02.